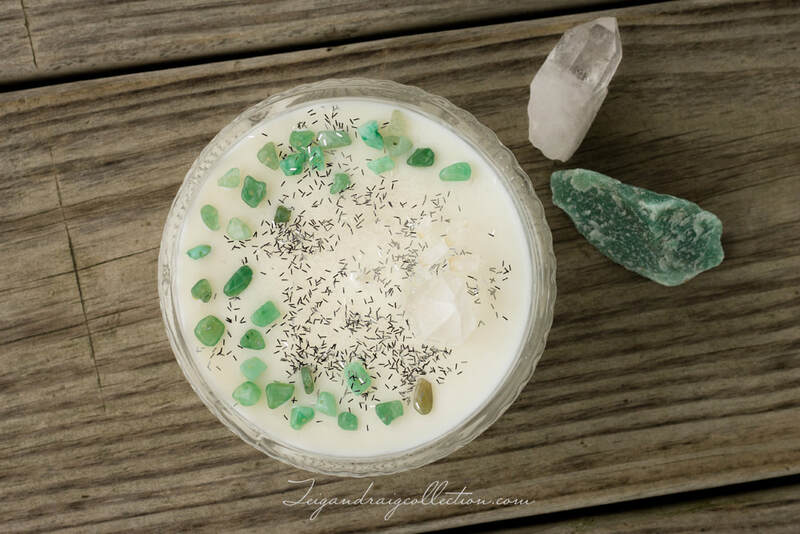 Handmade soy candles infused with gemstones and essential oils. Each is one of a kind and unique. 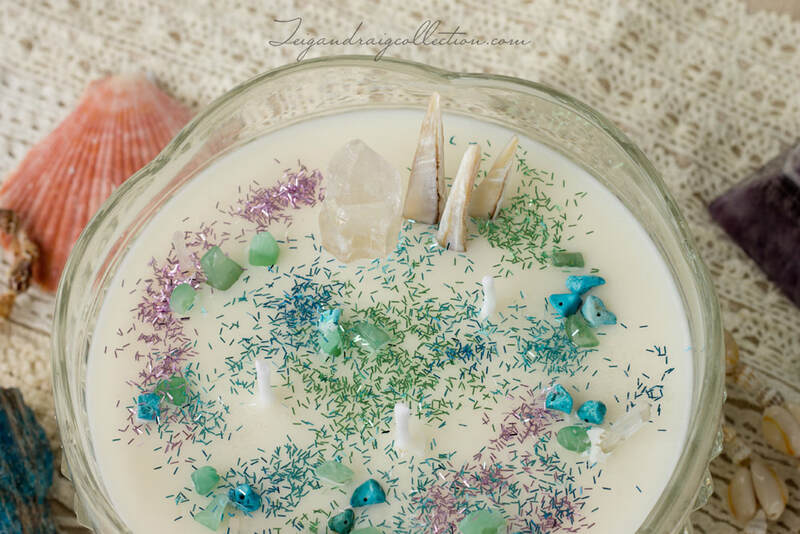 These candles are perfect for metaphysical workings, spell-craft, or just to burn to diffuse the heavenly scent of essential oils throughout your home or sacred space. 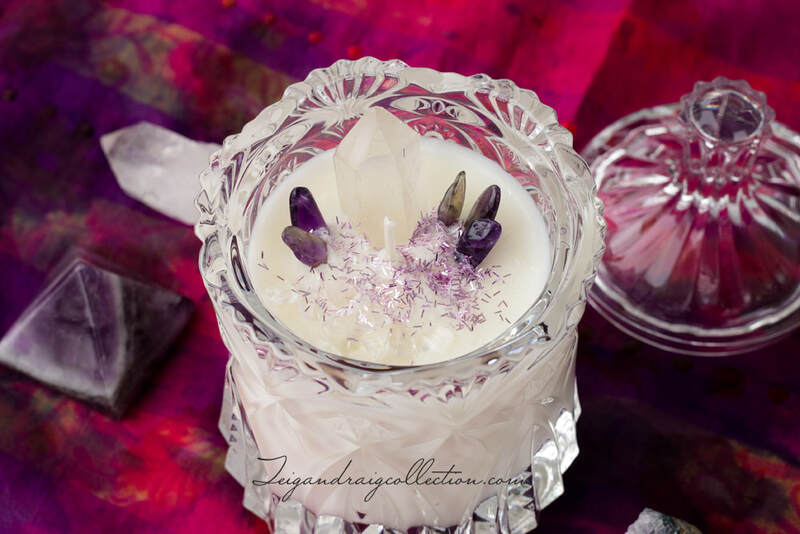 Gemstone candles are a specialty item with very limited quantities available. Quantities of each will be noted below within each respective item description. More unique candles will be added regularly, so be sure to check back often. 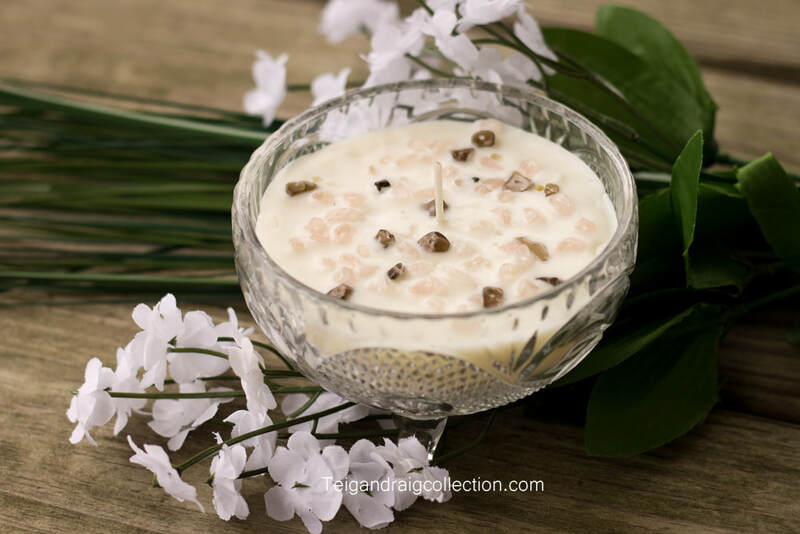 Quantities of handmade candles are limited. Honor the Dragon with my limited edition Dragon's Breath candle. 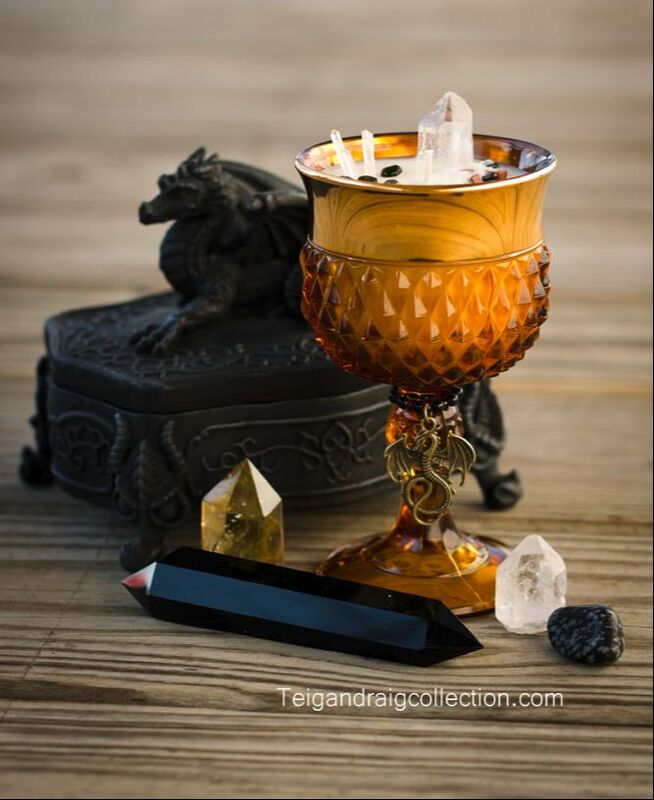 This is a soy wax candle with anise, sweet orange, and sandalwood essential oils and features a clear quartz point, three clear quartz needle points, faceted pyrite beads, obsidian chip stones, and sparkling goldstone chip stones in a beautiful golden rimed amber goblet with a bronze dragon charm. Candle measures 5.25 inches tall by 3 inches wide. 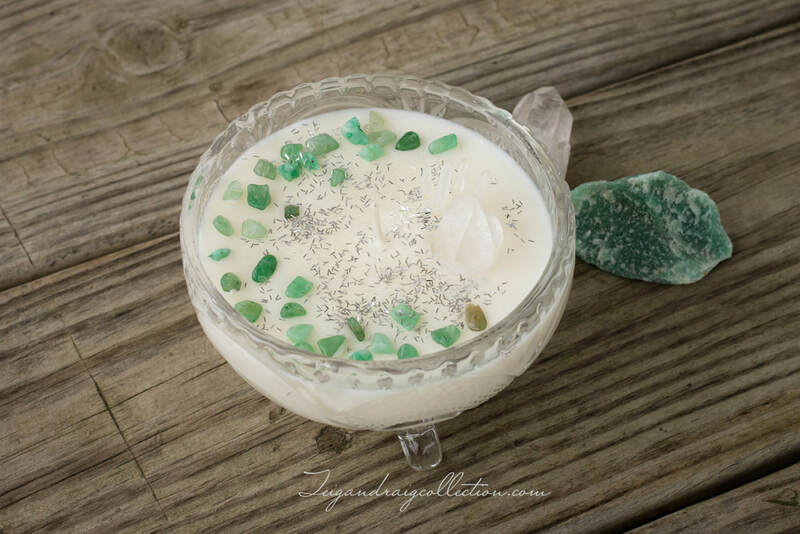 This gemstone candle is full of mermaid magick and the energy of the sea. Take a trip to the beautiful underwater city of Atlantis. 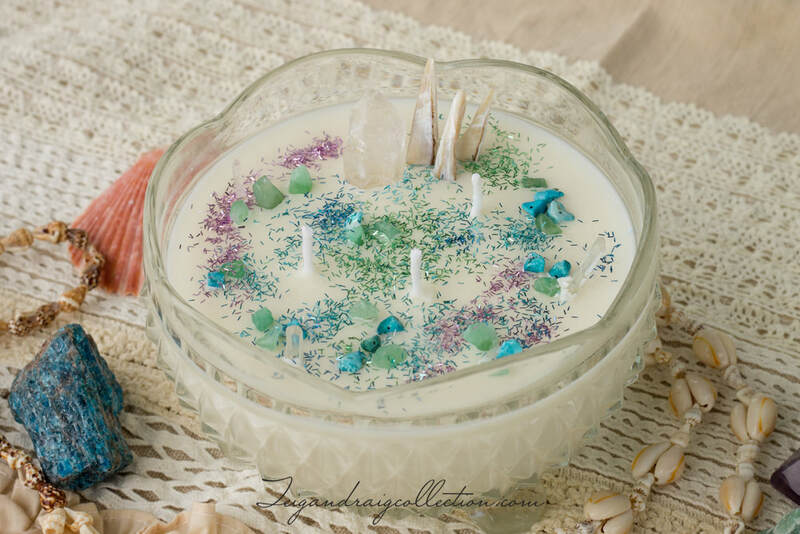 Burn this candle to invite the playfulness and protection of merfolk, and be awash in the fluid and ever-changing Element of Water. 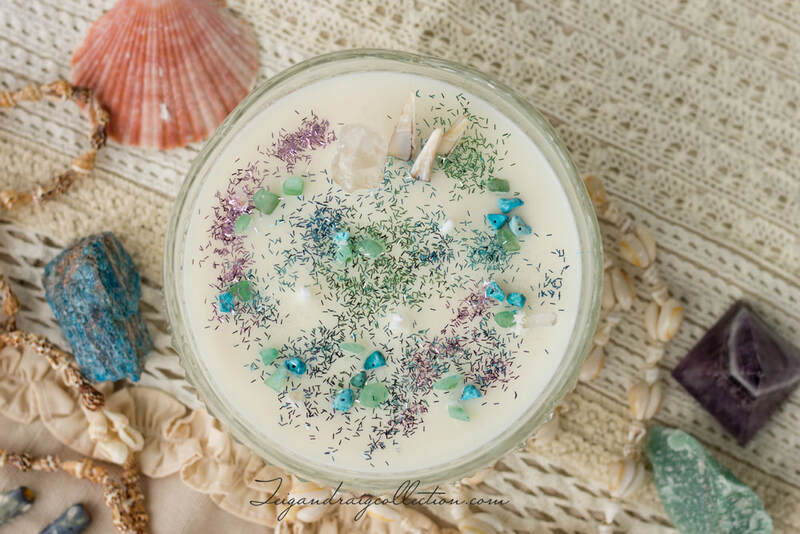 This unscented soy candle features a clear quartz point, quartz needle points, sea shell points, green aventurine, and turquoise colored howlite with shimmery glitter in blue, aqua, green and lavender in a scalloped edge cut glass container with three wicks. Candle measures approximately 5.5 inches in diameter. Only two available. 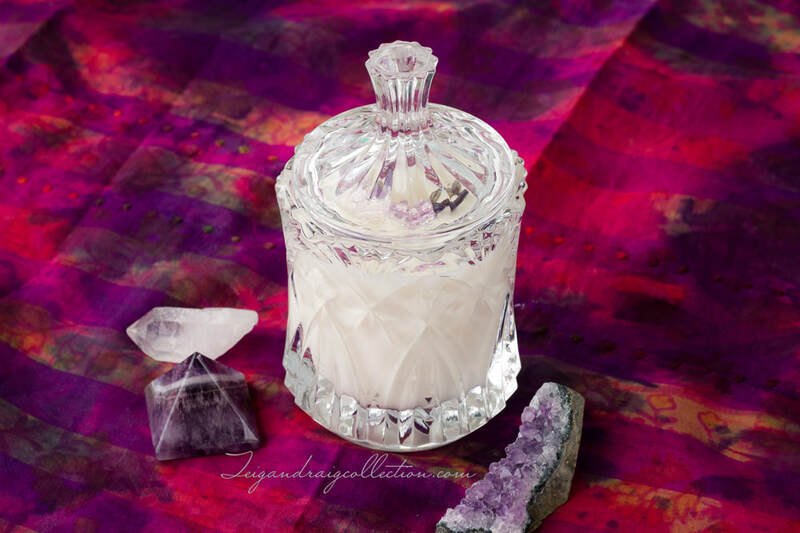 Featuring the master healing stones of clear quartz and amethyst, this beautiful candle invites gentle healing while facilitating peace and love. Clear quartz raises the vibration and clears the aura and environment of negativity. Amethyst opens the psyche and purges emotional baggage. Amethyst is a warding stone to protect against negative energies. 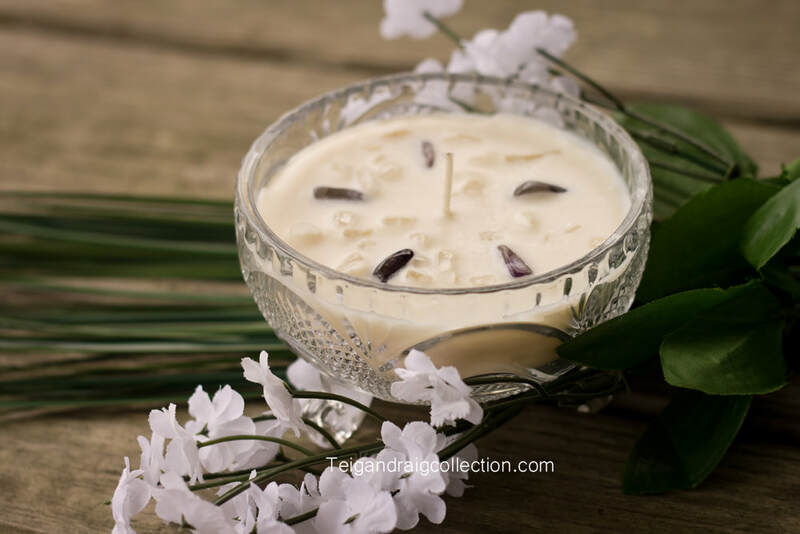 Burn this 100% soy candle while meditating to usher in cleansing and healing energies. 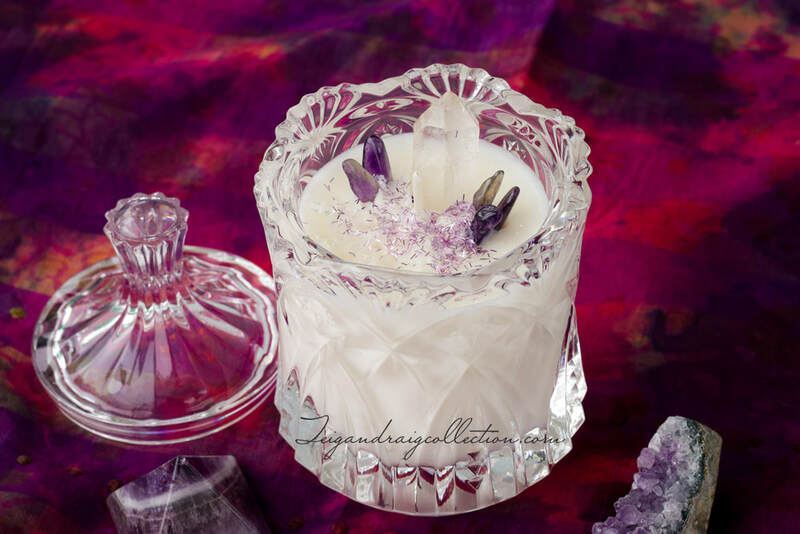 Candle in unscented in a beautiful clear cut crystal container with matching lid. Candle measures 5.25 inches tall with the lid, and 3.45 inches without the lid. Container measures 3 inches in diameter. Only one available.